The highly anticipated and most awaited recipe is finally here! Matt created the ultimate keto dessert with this Low Carb Coconut Cream Pie. If you plan on making it make sure you share it with others or you will end up eating the entire pie in one night - it's that dangerous! There are a lot of steps that go into this recipe, but don't be intimidated because Matt will show you how to make it step by step in the recipe video below. You can even omit certain parts if you feel like it's coconut overkill, but we suggest you make this exactly how we did for maximum pie enjoyment! Matt worked long and hard to get this recipe perfect, and it's finally ready to share! There are three distinct layers, which means a lot more preparation than you were hoping for, but we assure you it's more than worth it! Matt even walks you through the recipe in the recipe video above you can get it exactly to your liking the first time around! You won't want to skip out on making this for an upcoming birthday or celebration! All your non-keto friends won't even know it's good for them. With my being allergic to all tree nuts, I'm left with the options of using coconut or peanut based flours and ingredients. While it's sad for me, it's great for the food blog because so many of you also have nut allergies. Lucky for me this entire pie is nut free so I can indulge, but if I'm looking for something a little less time consuming to make I like to turn to our coconut flour chocolate chip cookies, keto brownies, or olive oil cake! There are way too many good ones to only suggest 1 or 2 desserts! There aren't many words that can describe to you the taste you'll experience and sensations you'll feel during and after you eat this incredible coconut cream pie. For all you coconut lovers out there, and we know there are a lot of you, this one if for you! Make it for you birthday cake, a special occasion such as an anniversary or graduation, or simple because you love coconut. 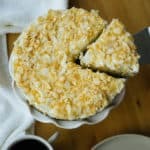 Either way, this low carb coconut cream pie is going to become your new favorite KetoConnect recipe! 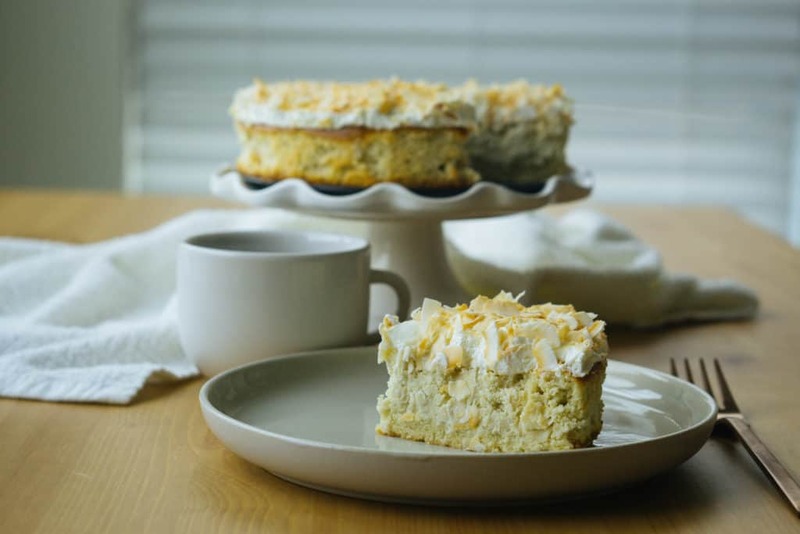 Recipe can be quickly added to MyFitnessPal - Search "KetoConnect - Coconut Cream Pie"
Preheat the oven to 350 degrees and line a baking sheet with parchment paper or a silicone mat. Make the crust: Combine the coconut flour and powdered erythritol in medium sized bowl. Add the melted butter and combine. Add the egg and combine using a spatula. The crust should come together as a dough. Transfer dough to a 8 inch spring form pan and flatten it out to cover the bottom of the pan evenly. Poke several holes in the crust with a fork and place on the lined baking sheet. On the other half of the baking sheet place the 3/4 cup of unsweetened coconut flakes to toast (used in filling and topping). Place the baking sheet in the oven and bake for 15 minutes. At the 5 point mark remove the flakes and set aside in a bowl - they should have browned - and place the crust back in the oven for the remaining 10 minutes. Set the crust aside to cool and lower the oven temp to 300 degrees. Make the filling: In a large bowl combine the coconut cream of an entire can (13.66 oz), heavy cream, vanilla extract, liquid stevia and powdered erythritol. Combine using a hand mixer. Add the eggs, coconut flour and 1/2 cup of the toasted coconut flakes and combine once more. Grease the sides of the spring form pan (we like to use coconut oil spray) with the cooled crust and poor the filling onto the crust. Let the pie cool for 30 minutes and then place in the fridge for 1 hour to set. Make the topping: Whip the heavy cream into stiff peaks. Add the stevia and combine. Place in the fridge alongside the pie. Make the pie: Top the chilled pie with the heavy cream topping and spread evenly. 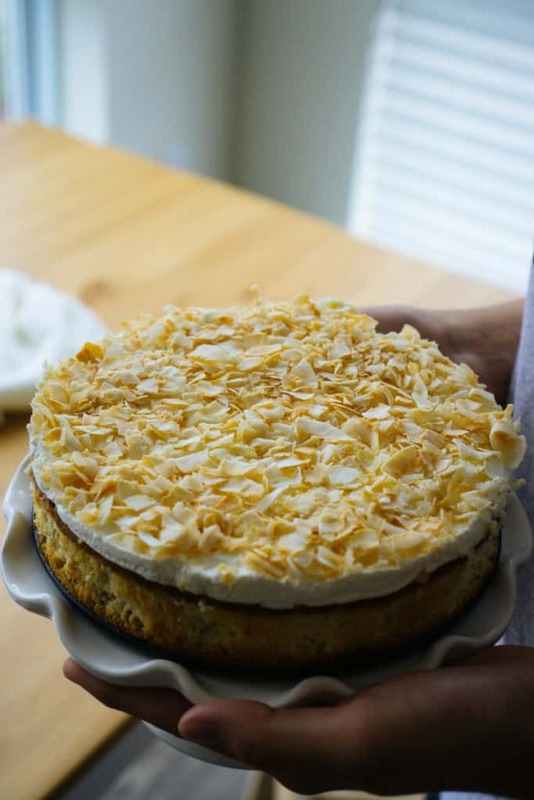 Top the cream with the remaining (1/4 cup) toasted coconut flakes and gently press into the cream. Refrigerate for another hour prior to serving. Coconut Milk Tip: Place the coconut milk can in the freezer for 5 minutes prior to using in the filling. This will separate the hardened cream from the liquid. The liquid contains all of the sugars.